Several months ago I showed you that we had begun to knock out the walls in my three teenage boys’ bedroom. You can see the beginning of the makeover HERE. The room was poorly insulated, the plaster walls were falling apart, and the room was well, just…ugly!! We bought furniture for the room from ReStore. 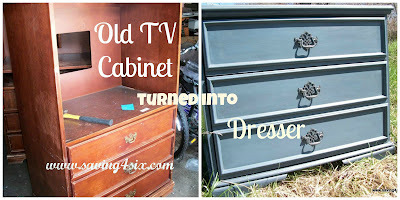 Taking apart these old TV cabinets to turn into dressers was one of my favorite parts of the makeover. You can see how we did that HERE. After making my own chalk paint and tinted wax and using it on the tv cabinets, they turned out amazingly well. You can see the details HERE. The progress continued in the room with laying new flooring, putting up insulation and drywall, and running new wiring. Those details are HERE. I then made over the wardrobes for their room. These had been used in a nursing home facility but once they got a face lift, they were perfect for this closet-less room. You can see the wardrobe process HERE. So after this little recap, I am pleased to be able to show you the reveal of the bedroom with all these pieces put together. The power of paint was evident in this little piece above. You can see what it looked like before HERE. I haven’t shared much about the ceiling fan, the light or the beam…those are all details I’ll share a different day, but you can see the finished product now. So after months of work, I could not be more thrilled with the results! Now, if you are a regular reader or follower of my blog you may say…wait a minute…there were three beds and three boys in there before. What happened? Well after many weeks of camping out in the basement, my oldest son decided to stay there. We have turned our school room into a bedroom for him. I’ll be sure to show you his little bachelor pad soon. Nice job. I esp like the 2 tall armoires … the paint treatment is cool! Hello Carrie…. You did a great job on this room, and I especially love the furniture finishes! Stopping by today from Dorothy Sue and Millie B’s too…. That looks great. Nice job. I am sure the boys will enjoy the room for many years to come. Fabulous! amazing what a little paint will do, to tie together mismatched pieces of furniture. Love the blue and the plaid. Really love how everything turned out. A real grown-up boy’s room! I’ll bet they just love it. Looks very cozy – I bet they love it. My son’s room is on my agenda (but that’s not new… my agenda is getting dusty), so I had to take a peek at your reveal. Clever repurposing! I love the touches of bright in the room. Fantastic makeover! I love how it all turned out and the colors that you used.